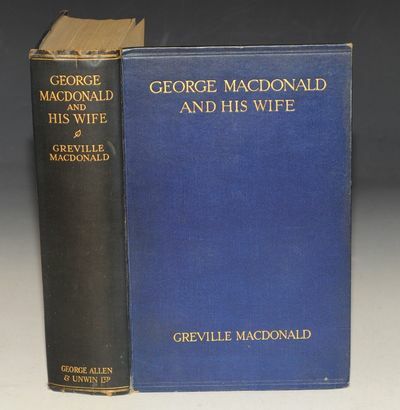 viaLibri ~ George Macdonald and His Wife. With 28 Illustrations and an Introduction by G.K. Chesterton. SIGNED COPY. George Macdonald and His Wife. With 28 Illustrations and an Introduction by G.K. Chesterton. SIGNED COPY. London, George Allen & Unwin Ltd., 1924 1st edition. Hardback, 10 x 6.5 inches. Navy blue cloth with gilt lettering to spine and front. In very good condition. Rubbing to edges and corners, to pend of spine chipped with a couple of small nicks at bottom. Spine darkened. Some minor marks to boards. Front endpaper cracked. Authors inscription to endpaper "Sir James Barrie, with the Author's admiring regards." Endpaper darkened. Some slight fading/tanning to pages with some light foxing spots and some neat pencil notations. Else pages very clean and tight throughout. 575pp. With 20 B&W illustrations over 15 plates, including a frontispiece and half-title illustration.